Refer to the "navigation and multimedia system owner's manual". The rear view monitor system assists the driver by displaying guide lines and an image of the view behind the vehicle while backing up, for example while parking. The screen illustrations used in this text are intended as examples, and may differ from the image that is actually displayed on the screen. 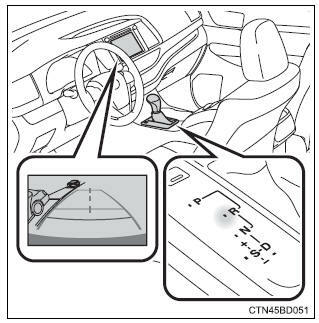 The rear view image is displayed when the shift position is in r and the engine switch is in �on� position. The rear view monitor system will be deactivated when the shift lever is in any position other than r.